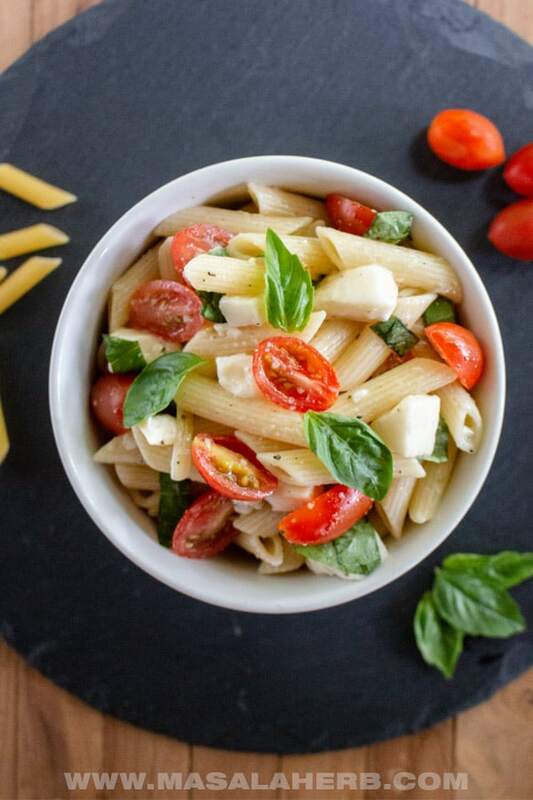 Easy Caprese Pasta Salad, a summer salad classic with a twist. This Italian tomato mozzarella Caprese pasta salad is a variation of the classic Caprese salad, which is one of my favorite salads! I had the Caprese pasta salad in North Italy in a restaurant next to the Como lake, years ago in a village restaurant when we visited with my parents. In Italian, this salad is known as insalata pasta alla caprese. 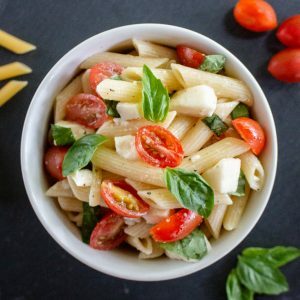 Cooked Penne Pasta, Fresh Tomatoes, and Buffalo Mozzarella are combined, and a drizzle of extra virgin olive oil with a pinch of salt and black pepper add the little extra touch to the cold summer salad. It’s that easy but at the same time a real delight! 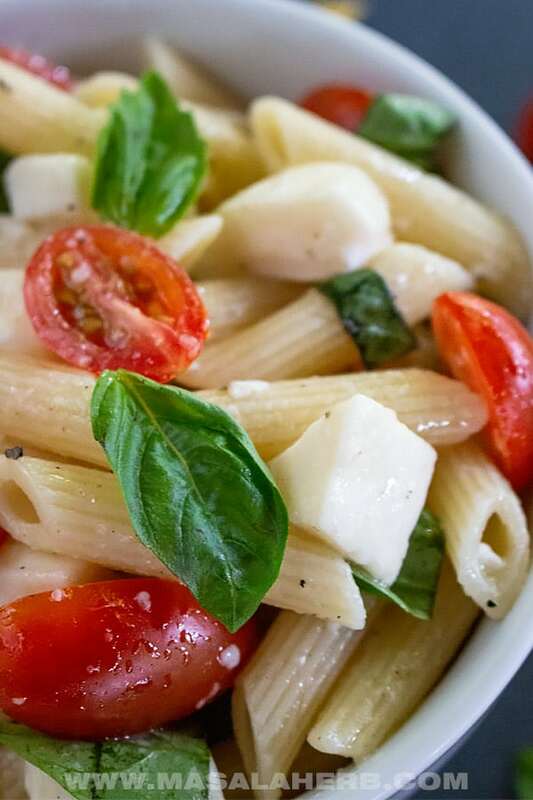 For a delightful cold Caprese pasta salad, use only quality ingredients. This is important because it will make or break your summer salad. Mozzarella Cheese – Has to be the fresh fBuffaloallo Mozzarella which comes packed in liquid. The good ones are only made by small cheese makers and are usually of a higher quality than the commercially available cheap versions. Besides the ball tends to be bigger from small cheese makers. Commercial Mozzarella has reduced in size over the years so it’s really not good value. You can use one big Mozzarella ball or the small mozzarella balls. Tomatoes – You can use Cocktail Tomatoes or Cherry Tomatoes, whichever you prefer. The Tomatoes should be red, firm and juicy. Basil – Use Italian (regular) Basil leaves in its fresh form. Olive Oil – This is another crucial ingredient. Use only Extra Virgin Olive Oil. I like the cold pressed organic kalamata olive oil from Crete (a Greek island) it’s superior in flavor and will bring out the mozzarella, tomato and basil flavors and textures. Seasoning – Salt and Black Pepper. To add increased flavor to your caprese pasta salad, you can use Fleur de Sel de Guerande [Brittany region] or de Camargue [South France]. This flaky salt comes from France and is the best you can get in quality. The salt is formed on the water surface, thanks to the local elements. Strong daylight sun, cool nights and a special sea wind in the regions create this unique salt. How to make Caprese Pasta Salad? The preparation of this caprese pasta salad is really easy! 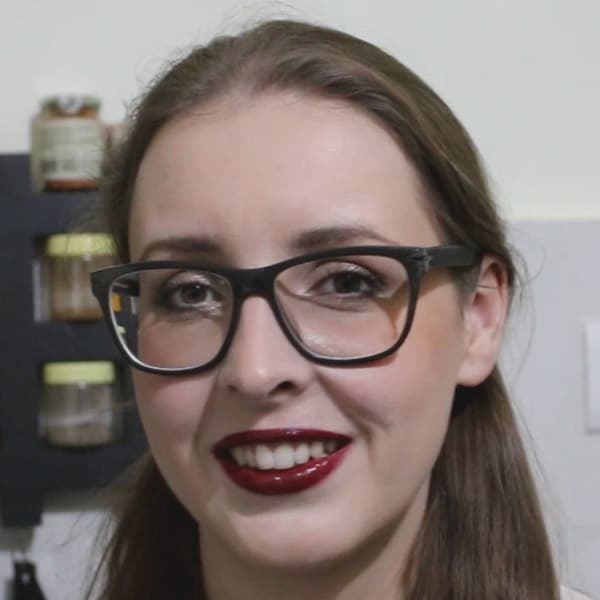 Watch the video, the recipe is further below. Caprese pasta salad with tomato, buffalo mozzarella, fresh basil leaves, a drizzle of quality extra virgin olive oil, back pepper, and salt. Cook your Penne Pasta according to package instructions. Once cooked al dente (to the bite) let cool. You can keep the Pasta in your fridge to cool. If you use a big Mozzarella ball, cut into smaller pieces (to the size of the halved cocktail tomatoes) or if you use small mozzarella balls just let them be as they are. Add the Mozzarella to the tomatoes. Cut your clean and fresh Basil leaves into small strips. Add to the tomato and mozzarella. Now add <g class="gr_ gr_96 gr-alert gr_spell gr_inline_cards gr_disable_anim_appear ContextualSpelling multiReplace" id="96" data-gr-id="96">your</g> cooked and cooled pasta to the mixing bowl with the other ingredients. Add Salt and Black Pepper and pour the olive oil over the salad. Mix the salad well with all the ingredients. Don't over mix or the ingredients will get mushy. Enjoy cooled as a delightful summer salad. Rule of thumb is to use quality ingredients to bring out the flavors of this caprese pasta salad. That is how this dish is a winner with minimal ingredients! For extra virgin olive oil try to get kalamata organic cold pressed olive oil. 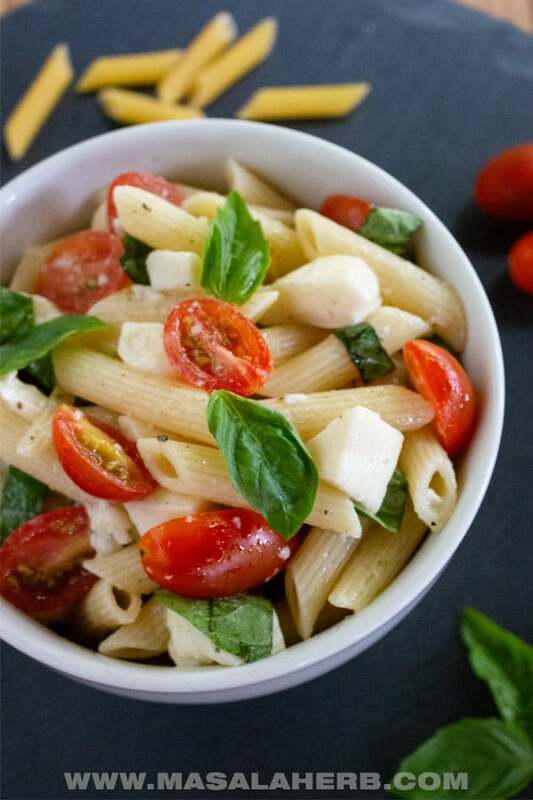 Dear Reader, with what are you planning to serve this cold caprese pasta salad? Such a beautiful summer salad. My tomatoes are just now starting to ripen so I can’t wait to make dishes such as this one with homegrown tomatoes and basil. YUM! Hi, this may be interesting you: Easy Caprese Pasta Salad [Summer Salad]!